I swear, these are real. 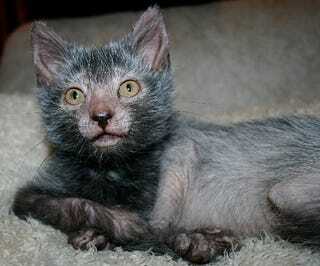 Kitties that look like werewolves, it's like the internet and the SyFy channel had a litter. Someone is developing this breed of cat called the Lykoi (Greek for "wolf") around a genetic mutation that leaves them without an undercoat and with a peculiar grizzled top coat. The lack of said undercoat means that they don't have any hair around their eyes, muzzle, legs and belly, which gives them that distinct B-Movie look. The Domestic Shorthair mutation supposedly is a safe one, meaning the cats are healthy. While it's a fairly new breed, they are recgonized as a breed with a "registration Only" status with The International Cat Association, so maybe down the road you'll see werewolves being judged at cat shows. There's a great article here that has some more insight into the mutation and the testing process the breeders went through to ensure their kitties were healthy before they started a breeding program. And here's a breeder's website for more werewolf kitty action shots.